Size: Plate is over 14 inches across! This is simply an incredible find. It is an amazing plate with TWO HUGE Archaeocidaris wortheni and at least SEVEN Archaeocidaris illinoisensis from the Mississippian of St. Louis. Fossil echinoids from the St. Louis area are famous around the world and have been extremely sought-after by collectors for decades. 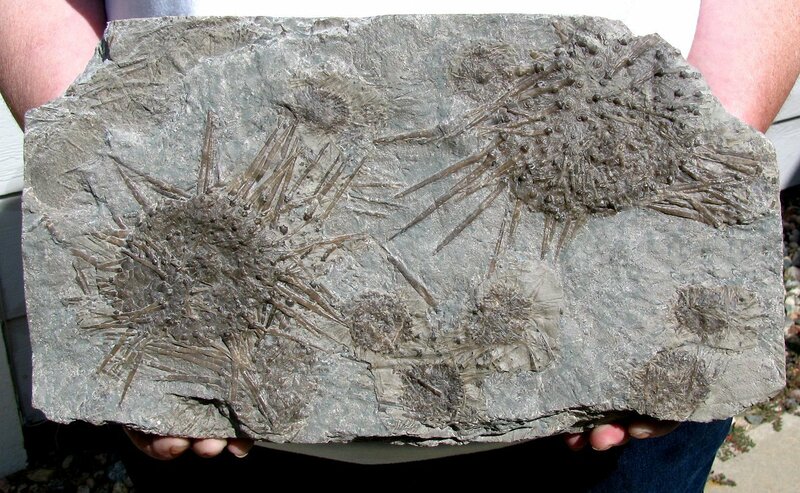 These spiny urchins are larger than the Lepidocidaris found in the Mississippian Warsaw Formation, and are OLDER than the Pennsylvanian Archaeocidaris from Texas. The large, extremely rare Archaeocidaris wortheni urchins are complete with MANY long spines still intact. The huge echinoids display well on the large, rectangular plate of matrix that also has SEVEN fabulous examples of the smaller Archaeocidaris illinoisensis. This is a very special and extremely collectible fossil, a unique multiple example of two ultra-rare species of Archaeocidaris from the St. Louis Formation.